In a food processor, mix oats, coconut flakes, nut butter, chia seeds, protein powder, large scoop of coconut oil and maple syrup (amount determined by texture of mixture and desired sweetness). Process until a soft ball of dough forms. If mixture appears too dry, add more nut butter, coconut oil or maple syrup, it should resemble the consistency of cookie dough. In a small bowl, heat 5 tablespoons of coconut oil in microwave until melted (roughly 35 seconds). Combine cocoa powder and stir until the coconut oil looks like melted chocolate**. Shape spoonful of dough mixture into a disc and place 1-2 dried cherries in the center. Roll to form ball around the cherries. Drop ball in “chocolate” and spoon to cover. Remove and place ball on a wax paper-lined baking sheet. Repeat until all dough has been used (roughly 16 balls). There will be leftover coconut oil and cocoa powder mixture. Place baking sheet in freezer 15-20 minutes until “chocolate” has set. 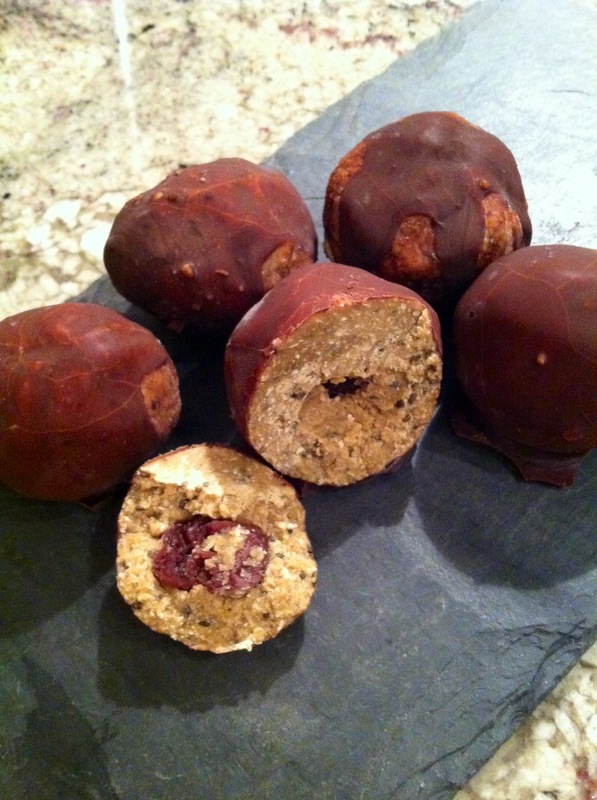 Remove from freezer and dip the balls in remaining chocolate again to create a thicker “chocolate” coating. Freeze another 15-20 minutes. Store balls in Tupperware container in the refrigerator or freezer. **All credit due to my friend and favorite yoga-teacher-not-currently-yoga, Katie, who taught me the coconut oil + cocoa powder = healthyish chocolate trick with these.